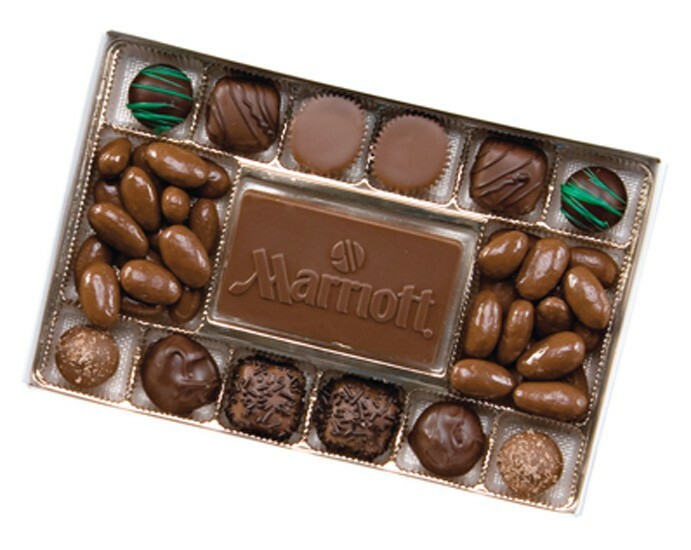 14 oz box containing 1 chocolate candy bar business card with stock message or custom message or design surrounded by 12 assorted chocolate candies: 2 chocolate candy peanut butter cup confections, 2 milk chocolate candy nougat confections, 4 truffles, 2 cherry cordial confections, 2 dark chocolate candy cream caramel confections, and 4 oz of chocolate candy covered almonds. Box secured with gold or silver stretch band ribbon. Includes 4 color custom imprinted label on clear cover on box. Centerpiece available in: Milk, Dark, Dark Mint or White Chocolate Flavors.